Kaunas, where I live, has a reputation as being artsy and clever. We’re home to 6 different universities and are considered the “most Lithuanian of Lithuanian cities.” Now, nationalist pride aside, one of the things this means is that while Vilnius, the country’s capital, gets the pressure of being the proper and sophisticated “big brother” we get a little more freedom to be wild and crazy. We get to indulge ideas. One of those ideas has found form in our annual Christmas Tree design for the big, official city tree in Rotuse Aikste (City Hall Square). A few years ago, our tree was made of the recycled bottoms of green, two litre coke bottles. The year after that was a gold, angel festooned spectacle followed last year by a tree “knitted” from recycled plastic bags. This year, we all wondered what it was going to be. Monika called and invited a few people to go down and see the official unveiling. Since I’d never done that, I decided to tag along. All told, there were 6 of us heading down the street (we both live on the main street in old town, which dead-ends at the Rotuse). Getting to the square was a nightmare itself. “There were too many people on our street.” This is a phrase we like to joke about, especially during summer when the road is lined with outdoor patios from bars and restaurants (there is a thriving business here for the setting up and dismantling of outdoor patios in May and October), but that phrase had never been truer than this night, when I’d say a decent percentage of Kaunas was crowding around the city hall to listen to speeches, watch live entertainment and see the tree. When we got to the square, we pushed our way through towards the front where, if you got on tip toes (even Monika, who’s tall!) you could see parts of the stage and the tree, towering overhead. 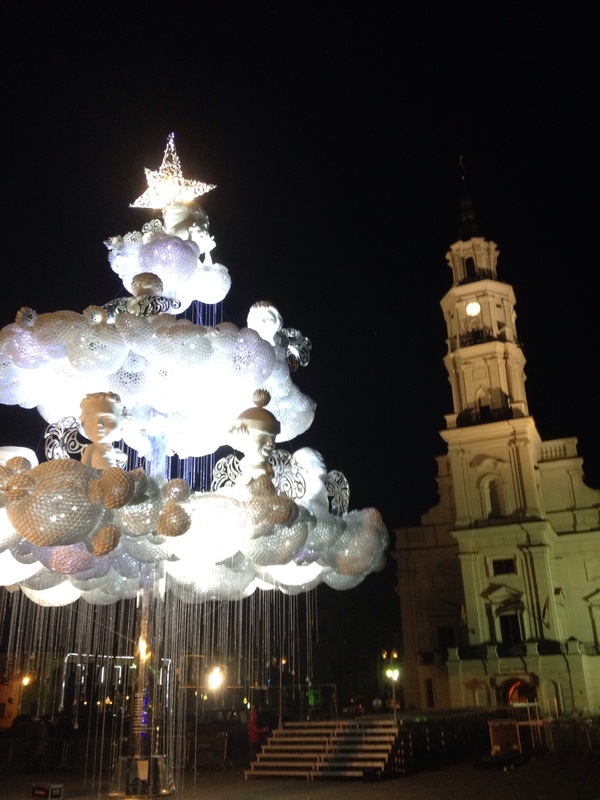 The tree this year is made of recycled plastic cups and designed to look like a tri-level cloud, replete with big-headed angels staring out in all directions. The entertainment, for me at least, was fun. There was a stage with a chorus of singers belting out traditional Christmas tunes which had been translated into Lithuanian. Santa Clause is Coming to Town and Leonard Cohen’s Hallelujah took on a whole new significance. The festivities culminated with a huge fireworks display…and then the mass migration out of there. If we thought getting INTO the square was tough, it was nothing compared to getting out. The bottleneck was so severe that at times there was literally no room to breathe. If you had been able to lift your feet you wouldn’t have fallen as the tightly packed crowd would have just carried you along. At one point, I actually turned to a group of young people pushing me and, laughing, told them to relax. We weren’t holding them up on purpose. The 4 or 5 minutes it took to get out were, honestly, some of the most uncomfortable of my life. I knew it wasn’t going to last long, and really had to laugh, but it truly was not a pleasant experience. I’m not a big crowd goer to begin with but this was just too much. Thankfully, since we live in the area, we were able to get out of the crowds and take the back way to Monika’s place where we indulged in hot wine, vinyl records and birthday shenanigans (it was Mantas’ birthday). And counted ourselves lucky to live in a place where the Cloud was made manifest… and holiday safe.